Achieving Sustainable, Exemplary Care through Continuous Quality Improvement. War Memorial Hospital is accredited through Det Norske Veritas Healthcare (DNV). DNV began operating in the U.S. in 1898. In 2008, the Centers of Medicare & Medicaid Services (CMS) approved DNV to assess hospitals for quality of care and patient safety. This means DNV has the authority to approve or disapprove hospitals for CMS reimbursement if they do not meet the standards for quality of care and patient safety. War Memorial must maintain compliance with the DNV NIAHO Standards. The NIAHO Standards are based upon the CMS Conditions of Participation, and therefore assist War Memorial in maintaining compliance with CMS as well. There are 134 Standards that cover a variety of departments and processes within the hospital. DNV grants Accreditation every three years. However, War Memorial undergoes a DNV survey every year to ensure we are maintaining compliance with the NIAHO Standards. This holds us accountable and reinforces our top priority: patient care and safety. In addition to upholding the NIAHO Standards, War Memorial is also ISO 9001 Certified through DNV. ISO 9001 is a Quality Management System with specific principles related to: a strong customer focus, using the process approach, and striving for continual improvement. ISO 9001 ensures that Quality is consistently improved so errors are reduced. War Memorial has chosen to implement and follow an ISO 9001 Quality Management System because it will ensure that patients receive consistent, good-quality products and services. 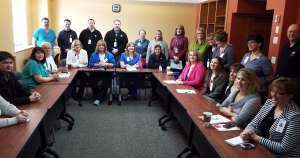 Each morning, Hospital administration and department leaders gather for a brief meeting to report on any safety-related matters that have occurred in the past 24 hours, or have the risk of becoming a safety concern in the upcoming 24 hours.This daily sharing of information and concerns began in October of 2013 and was adopted as a method to improve quality of care and plays a key role in maintaining a safe environment for our patients, visitors, and employees.The Daily Safety Briefing is just one example of how WMH continually adopts new methods for improving care. Pictured on the right are the team members gathered at an average safety briefing.